All Prices excluding VAT (means VAT will be added during purchasing process as applicable according to local legislation), with the transaction you explicitly agree to the ► Business Terms of the ITSM Shop. All our ITSM templates come with a 60 day money back guarantee. These process sets are based upon our well known ► ITIL® 2011 Process Library. It describes the processes of IT Service Managements utilizing the market leading process management system ► Signavio Process Manager notated in BPMN 2.0, and derives from the experience of nearly 20 years of successful ITSM project implementation. 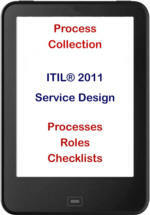 The purpose of these process sets is not provision of theoretical knowledge, but demonstrate the experience of numerous implementations of process oriented IT Service Managements from practice. From the ITIL® standard's perspective all partial topics have more or less the same priority, but practice tells a different story. exactly according to this we designed our process library. Practical relevance is the focus.